The property has been furnished to the highest standards and is a truly cormfortable family home with all the amenities you would expect. It retains the charm of a Victorian era property with its elegant, spacious rooms, high ceilings (up to15 foot) and original features. Spread over just two floors (2800 sq. ft.) it has three double bedrooms, a office/den with sofa bed, small gym (Life-Fitness weights machine, cross trainer, TV, air-con etc. ), and laundry room. The West End with all its world famous shops, restaurants and theatres is 2 miles away. It is well connected by nearby bus, tube stations and taxi rank meaning you really don't need a car. Keywords: Flat with own entrance so feels like a house. 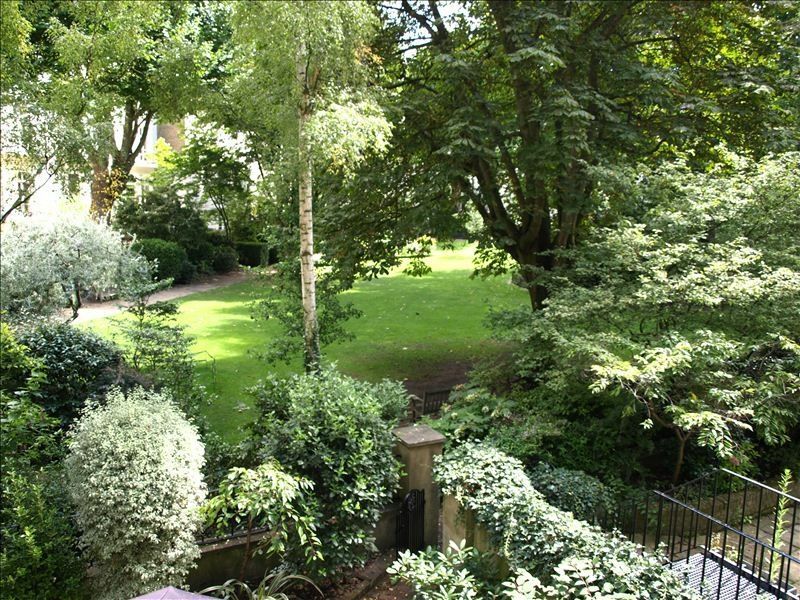 Direct access to communal gardens, 10 minutes to central London. Classic Victorian London white stucco property with a grand entrance, high ceilings and all mod coms, sound surrond (5:1), 52 inch flat sreen satellite TV, air-con. A cormfortable family home. Partner at a headhunting firm in London. This is not a rental purchase, but our main home. Feels like living in the country given the tranquil location and garden, but is only a few miles from the centre of one of the liveliest cities in Europe. I am tempted not to write this as I want to keep this our perfect London secret. What an amazing nearly one month stay. My husband and I rented this home with our 11 year old daughter. We had various family members visit throughout. The neighborhood is wonderful. I thought I knew london, but I never had explored little Venice. So quant, great little restaurants, friendly people. This is where you want to be in the summer in London. The owners were fantastic and always went the extra mile - providing us with a welcome basket and over nighting a forgotten phone. The gardens are lovely and you won't even know you are in a city. Yet, paddington is a 15 minute walk away. The Warwick tube is a few blocks as is the bus. This home provides it all - comfort, proximity, great kitchen and don't even get me started on the amazing massage chair. Perfect stay! This is a lovely home in an equally lovely setting! It is maintained to a very high standard and we were all delighted. (This was our first VRBO outing so had been anxious...but the home is as pictured and spotless!). We were comfortable (4 adults, 3 children) and had enough space to spread out, yet room to all gather at the table or in the living room. It was nice to come home to a quiet neighborhood and relax after our busy days of sightseeing and theatre. Very close to a nice pub, grocer, wine shops and restaurants. Would definitely come back. Highly recommend! Feel comfortable renting this property. My family of seven ( two parents, four grandparents, and one elementary school age child ) traveled abroad to experience London and the Olympic games. All ages found the property enjoyable. The pictures and description are accurate. Beyond the patio is a nice size common garden which is peaceful, semi private, and family friendly without being a playground for the neighborhood. Access to public transportation is just a short walk and makes for timely travel throughout London. If you feel like staying close to home, there are a variety of local restaurants, pubs, and pastry shops in walking distance. The owners greeted us upon arrival and were also available prior to the trip for general questions and recommendations. We weren't home much but the time spent at this property was comfortable and enjoyable. Consider the 4 - 5/5 a solid rating. We would return to the property rather than search for a new place. My son and I spent a lovely Christmas holiday in this home in order to be close to my daughter and grandchildren who live in nearby St. John's Wood. The owners welcomed us upon arrival and made all the logistics of staying here very easy and enjoyable. The house is very accurately described in the listing and the neighborhood is perfect for the real London "experience". We enjoyed walking to the nearby pubs and taking in the holiday spirit and found the small move theater 2 blocks away a real gem and wish we had the same in the states (food and libation delivered to your seats!). The shops nearby provide high quality everything in a very charming atmosphere. Tube stops are convenient and there's much to do and see within walking distance. Having Wifi available also expedites sightseeing research. We enjoyed our holiday and would definitely come back!